Located on the plaza level of the Spruce Camp Base Lodge. 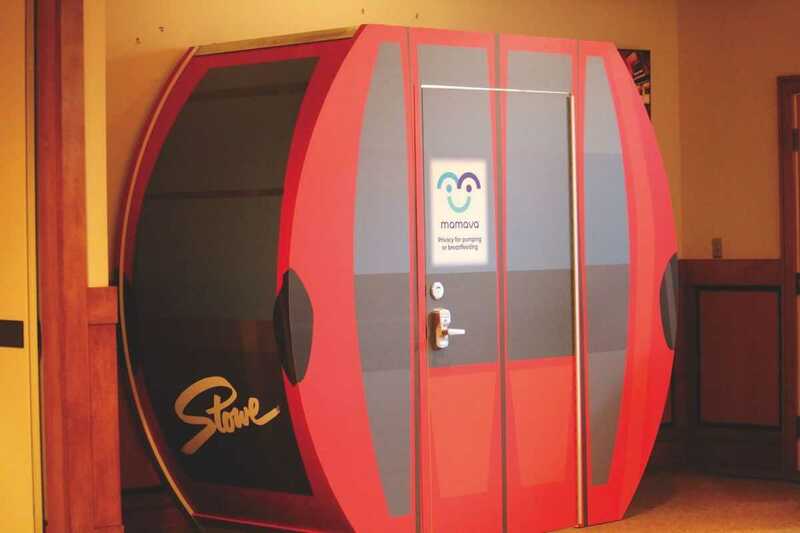 Stowe Mountain Resort in Vermont is the first ski resort in the nation to install a Mamava lactation suite for resort guests and employees, which provides a clean, comfortable and private space for mothers to pump or nurse. The lactation suite is located on the plaza level of the Spruce Camp Base Lodge, and is available during all operational hours of the base lodge. The nursing pod is self-contained with benches, a fold-down table, an electrical outlet for plugging in a breast pump, and a door that can be locked for privacy. The 4-foot by 8-foot pod is meant for individual use, but can fit more than one person, as well as mothers with babies and other children in tow. The resort sales manager said "Breastfeeding is of course welcome anywhere a mom feels comfortable throughout our resort, but for those who prefer privacy or need to pump, we now have this space for you."